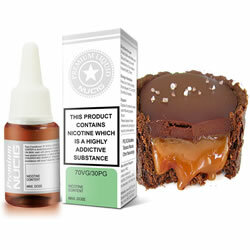 Try our Green label Toffee Caramel Fudge e-liquid flavour, it is a perfect blend for the perfect vaping experience. NUCIG Green Label Toffee Caramel Fudge e liquid contains only the purest and highest quality pharmaceutical grade ingredients and is for those who prefer extra smooth draw. Exclusive MaxVol™ technology delivers a smoother, richer maximum volume smoke (vapor), providing a rich sweet toffee flavour. Specially formulated to extend the life of your electric cigarette atomiser, clearomiser and tank. Not as sweet as the old caramel toffee flavour,that used to be sold. I prefered the sweeter one.But this OK. Plenty of vapour. Lovely, yummy - lots of nice smelling vapour ! I really enjoy this flavour, I can vape it all day without getting sick of it. Decent desert vape.